In 2014, it has year-to-date return of 1.87%. This foreign large blend fund has returned 16.50% over the past 1 year, 11.18% over the past 3 years, and 8.10% over the past 5 years. The 3 year beta is 0.96. The average price/earnings are 15.26. The average price/book is 1.51. You can buy this equity ETF from your brokerage. This iShares fund is available for your investment account, 401k plan, IRA (individual retirement account). The top 5 stocks in its portfolio are Nestle SA (NESN), Novartis AG (NOVN), Roche Holding AG (ROG), HSBC Holdings Plc, (HSBA), and Toyota Motor Corp (7203). Top 5 countries are Japan (20%), United Kingdom, France, Switzerland, and Germany (8.9%). This iShares ETF can be used as a core fund for building your portfolio diversification. 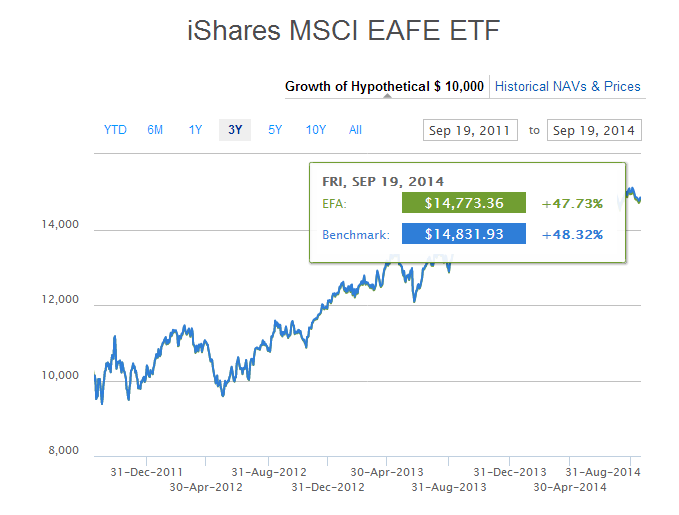 This iShares MSCI EAFE ETF has slightly higher expense fee than other index ETF.